Are you looking for a team who can execute well-planned and controlled demolition? Look no further than CA Drillers. Operating since 1981, we are the specialist demolition contractors offering services throughout London and the surroundings areas. With many years of experience and our unmatched expertise, we can undertake any complex project of controlled demolition or dismantling of structures followed by a thorough inspection of the site and a consultation round with our expert. Whether we work in a confined space, underground or at a height, we ensure best workmanship giving utmost focus on safety, health, and minimum disruption and noise. Since establishment, we have been rewarded for our high quality standards, market leading approach, professionalism and excellent customer service. As a part of our comprehensive controlled demolition services in the UK, our well-trained and qualified team can undertake demolition at all types of construction sites, enabling fast removal of materials and robust structures that are a result of drilling and sawing. At CA Drillers, we execute all controlled demolition projects in compliance with the most stringent of industry standards and regulations laid out by the British Government. In addition, we cater to all sizes and types of demolition requirements for single-dwelling properties through to large commercial developments. Moreover, we constantly review and update our policies to ensure that we practice the most advanced demolition techniques that impact the environment to the least extent possible. When needed, we also provide a complete robotic demolition solution. 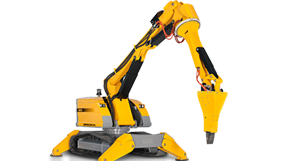 We use an advanced Brokk demolition robot and tools that are designed exclusively for demolition work and thus ensure optimized results. Want to know more about our controlled demolition service London? Or need a price quote for your demolition requirements? Give us a call on 08009750891 or you may also send us an email at info@cadrillers.com. Get in touch with CA Drillers TODAY.